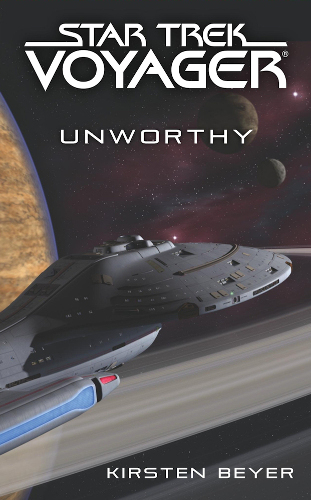 Kirsten Beyer, holder of the Voyager torch for the last few years, provides us with another trip to the delta quadrant to see the crew again. This time it's a stand alone novel that revisits a couple of the alien races met during the TV series. This makes for a nice change after the last few novels which have been a continuing arc. It's a good story that focuses on the idea of family. 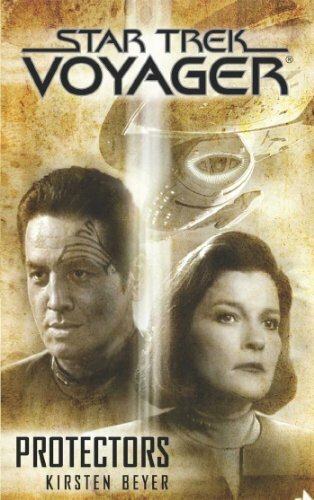 While a of of Voyager has that family feel to it, I do think that it's been a bit over done in the books of late, and it really does feel in this story that there's a bit too much focus on this theme this time which seems repetitive. The story here though is really well constructed from elements of the TV series and some earlier novels, woven together into a main plot that flows nicely, visits a number of spaces, and sees several developments that have potential to lead to more stories in the future. For the most part, an enjoyable visit to this part of the Trek universe. I still think that some more variety in the authorship would be good for the series, but this one works well. 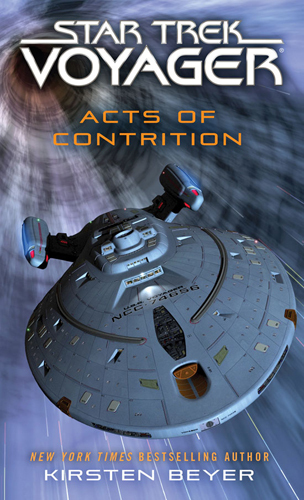 The latest novel in the Voyager continuation series follows immediately on from the previous story, 'Protectors'. 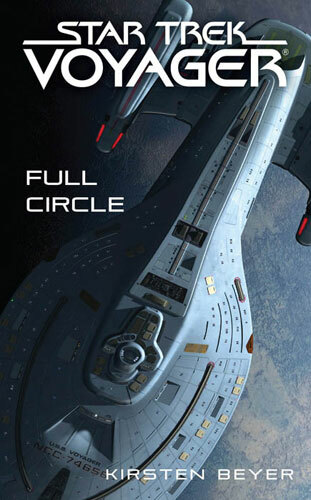 The 'Full Circle' fleet, including Voyager, are continuing diplomatic relations with a new culture, but far more interesting are the side plots about the characters we know from the TV show. This is the sixth book in the series that Kirsten Beyer has written, and I'm afraid to say I think it's all got a bit too convoluted to follow properly. I find that I can't remember what's happened well enough to understand the story properly, and it takes me most of the book to set in my mind who each of the new characters are. I think that at some point I'll have to do a full re-read to catch up. It's a shame as this happened before with New Frontier and the first DS9 relaunch, and I'd hoped that the editors might have improved things this time around. This book is the middle of a three-book story arc, and continues a number of plot lines set up in earlier novels. I found (as always), Beyer's strongest storytelling is in the parts that deal closely with the characters, their families, and their interpersonal relationships. Her action pieces and even the science fiction don't entice me as much. 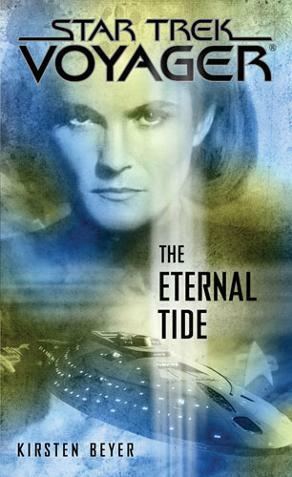 In this novel, the story lines around Tom Paris, Seven of Nine, and The Doctor were particularly interesting, and I wished that far more had been made of these - the 'main' plot felt much more about positioning the pieces ready for the final act in the next book. I didn't find this book as engaging as I would have liked, and I certainly didn't have an urge to constantly keep reading, but the plot is sound and I have enjoyed revisiting some familiar characters who continue to be written really well. I think that the next book should bring this sequence to a close though and allow for a good new entry point following that, to give new readers a chance to drop in without having to go through the back catalogue. 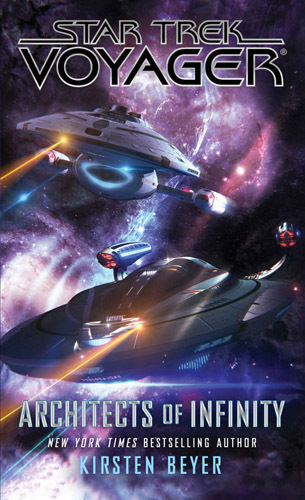 It's book four of Kirsten Beyer's re-relaunch of Star Trek Voyager following the events of the series finale, the first relaunch and the complicated inter-twined novels around the Destiny trilogy. Although the authors say that each book can be read alone, there are a lot of references here to previous novels and I think they would be frustrating and baffling to a reader who hadn't been keeping up. The story feels reminiscent of the author's earlier book Full Circle, with two parallel plot lines following different characters - one more action packed and one more emotional and character driven. The latter was the one that I found most engaging. It's hard to say much about it without dropping spoilers. The 'main' plot, on Voyager itself, sees the ship investigating a distress signal. There are some interesting science fiction concepts roaming around, but I didn't really feel they were explained in a way that I could really visualise what was happening. The technobabble throughout, but particularly near the beginning, actually distracted me from the plot and felt like it had been picked at random rather than even trying to sound like it was making sense. The book is meant to be the first part in a trilogy, but as a stand alone I felt there was something missing - it almost subscribes to what I've described before as 'middle-book syndrome', where everything that happens seems to just be reshuffling characters into the place they are wanted for the following book. Overall though it was enjoyable to visit these characters again and see where they are going next. There's a lot clearly been set up for the future, and if you want to keep reading, then this is a vital book in the series. 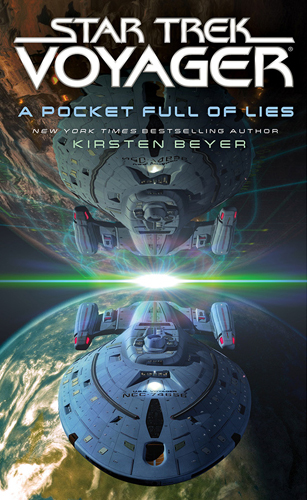 I really enjoyed the last two Voyager novels - both also by Kirsten Beyer - and have been looking forward to this one for a while. I was a tad disappointed though. Voyager is now part of a small fleet which has returned to the Delta Quadrant on a mission of exploration and diplomacy. 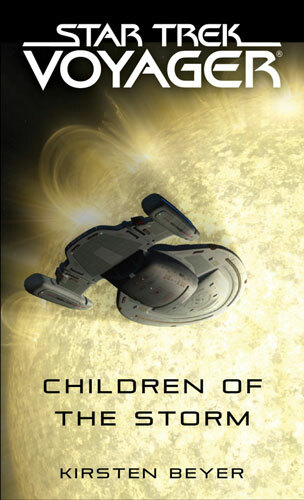 Three starships have gone missing while attempting to make contact with a hostile alien species - the Children of the Storm - and Chakotay and his crew must try to find them. The first thing to note is that the previous two books are prerequisite. You'll need them to know a lot of the characters and to understand the situation. I read the last one when it was released and had trouble remembering where things were, so I'd recommend refreshing your memory if you read it a while ago too. I found the beginning of this book to be quite weak - possibly because of my poor memory of where things stood - and quite a lot of the book focusses on inter-personal relationships among the crew. There are a number of new relationships, and quite a lot of focus on Miral, the toddler of the Paris family. It seems this has been inspired by the author's own recent parenthood, and in some places it's really cute, but occasionally goes a little over the top. One particular sentence had to be the soppiest and corniest thing I've read for a long time. 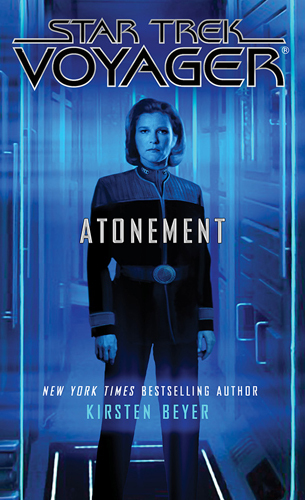 Once the plot got going though it switched back to the brilliance I've come to expect from this author, and I was very pleased with her descriptions of the aliens and the crews' interactions with them. Overall the range of new characters work really well and it's a good extension to the Voyager series without feeling forced. Once again I find myself looking forward to more.